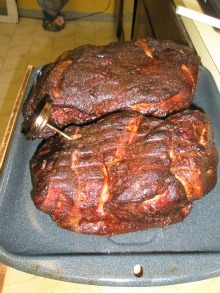 Smoked pork shoulder is an excellent choice when you’re planning your next bbq get together. One reason being, you can make a whole bunch of pulled pork sandwiches from one pork shoulder, which allows you to feed a large group of people for not to much money. Mix spices together until thoroughly combined. Mix ingredients together until completely dissolved. Sprinkle the entire pork shoulder with a liberal coating of rub and gently pat it into the meat. It’s now ready to smoke. Heat the smoker to 250 degrees. If you are using a grill set it up for indirect grilling. Place the pork in the cooking chamber, add the wood chips of choice and close the lid. In order to end up with a tender end product, the internal temperature of the pork needs to reach 195 to 205 degrees. This can take up to 8 hours. Once the pork reaches the proper temperature, remove it from the smoker, cover it with foil and let it rest for about 20 minutes. Now place it on a cutting board and break the pork into several large pieces removing the bones as you go. The pieces of pork can be pulled into shreds at this time or you can chop it into small bits and pieces. Move the pork to a large bowl, add about 1 cup vinegar sauce to the pork and gently mix together. Serve on bread rolls or buns of your choice. Put all your ingredients together and lets get smoky!